This seriously is awesome!!! I need to look into it! :) Thanks so much for sharing how you got it done. I bet your kids are loving it! I LOVE this idea!! No limit to what they can write & erase!! Sometimes my individual whiteboards are too small a space for my kids to write on. 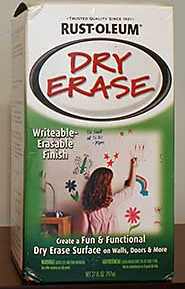 Does the paint (once thoroughly dry) seem to resist scratches? Love your blog! Kathie! So far the tables look wonderful! On Friday, I was a little nervous because we counted $217 dollars worth of change (from a Coin War Fundraiser) on the tables and they still look great! If only I had found this post last week! I did all the steps you mentioned except the sanding as it was school furniture. I got permission to paint but paint can be removed I feared sanding would not be approved. Well I used the whole box for one table and have 4 coats and there are spots you can are already chipping off. Sanding, as it turns out is a MUST do step. Oh no! All that work and it didn't even last a week! I just did a light sanding so the paint had something to adhere to. I made my students "placements" for their computers. I didn't want the computers scratching up the table tops. But so far after 4 months, they are still looking really great! What are your plans? Try and repaint?